Big news on the PennEast pipeline. The Federal Energy Regulatory Commission (FERC) granted the pipeline conditional approval in mid-January and the fight moved to New Jersey, where two weeks later the NJDEP denied PennEast’s water quality permit for the second time f or lack of information. With “opposition by virtually every community along the PennEast route, inadequate and inaccurate environmental assessments, and no proof of local customer demand, I simply can’t think of any legitimate rationale why this project was approved,” said NJ Congresswoman Bonnie Watson Coleman (D-12). 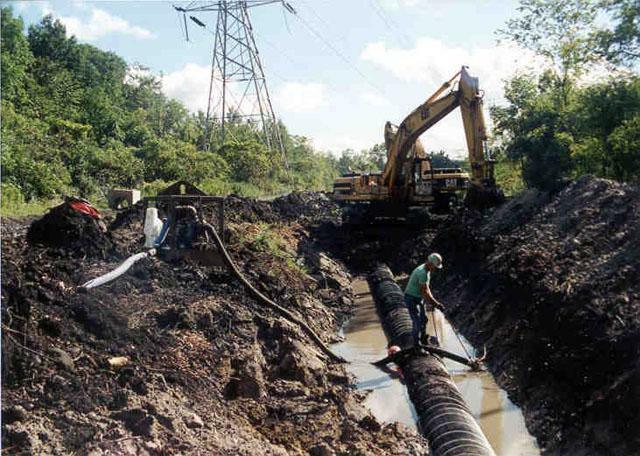 Dewatering pipeline trench. Photo courtesy of FERC. FERC ignored extensive economic and scientific evidence that PennEast would not provide a public benefit, and yet pipeline investors would take private property by eminent domain along its route, including farm and other open space property that has been put into perpetual conservation easement. The New Jersey Division of Rate Counsel believes the project is unnecessary, would be ” unfair to ratepayers” and “like winning the lottery” for the owner companies. In light of these facts, EELC’s attorneys brought a constitutional challenge against FERC’s use of eminent domain in November, and FERC acknowledged that its process, which our clients’ argue is a rubber stamp for industry applications, needs updating. In another clean energy pipeline case, community groups have raised significant funds for EELC’s counsel in their fight to prevent the transport of fracked gas from the Marcellus Shale across New Jersey to energy markets in New York City. The fracked gas from the Appalachian Mountains would be transported by NESE, the proposed billion-dollar Northeast Supply Enhancement pipeline expansion and extension by Transco Williams. Moving the state along the path to a fossil fuel free future, EELC funder the New Jersey Conservation Foundation and our environmental and community group clients are working with the Murphy administration to execute a clean energy plan for NJ that lays out the path for a third of the state’s electricity to be produced by affordable and renewable energy in 2030. EELC represented Environmental Defense Fund in its successful efforts to encourage BPU to approve smart meters for Rockland Electric’s customers. EDF continues to advocate for expanding the program for a more efficient and environmental-friendly energy grid. For four decades, Ronson cigarette lighters were produced in a factory on Manufacturers Place in the Ironbound section of Newark , resulting in contamination of soil and water by the industrial solvent TCE and other toxins. In 1989, the factory closed, and a decade later houses were built on the former factory site that had been restricted to nonresidential uses. Today, toxic TCE vapors seep into the homes. EELC is working with Ironbound Community Corporation and residents of Manufacturers Place to ensure they have clean air, water and soil. 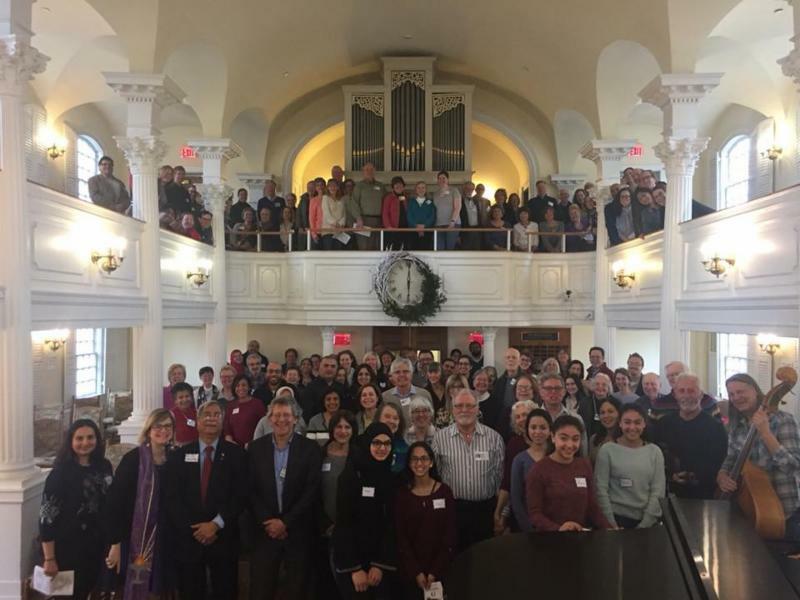 The Beacon Unitarian congregation joins together in a service devoted to environmental justice. the Beacon Unitarian Universalist Congregation in Summit where the Reverend Tanner gave a stirring sermon about the importance of healthy and safe homes and asked for donations from the congregation to fund expert work on how to remediate the former industrial site where housing now sits. Cynthia Mellon ofOur Power Campaign gave a voice to the local Newark residents who are harmed by toxins in the air they breathe and in the groundwater and soil below their homes. In the coming months, we expect further results from our legal efforts to protect the environmental and religious rights of the Ramapough Mountain Indians in Mahwah as well as our appeal of a new statewide municipal separate storm sewer systems (MS4) rule that does not adequately protect public health or the environment. Finally, I am happy to report that the Geraldine R. Dodge Foundation has approved EELC’s application for a $5,000 matching grant. The matching grant is for building the capacity of EELC’s Board. The grant is a testament to the Board’s commitment to the organization and the special recognition by the foundation. We welcome your individual support to help EELC match this grant.